I believe that everyone needs a good work bag. Whether it’s for business or school, you need a large bag that carries everything you need for the day. I first spotted the Michael Kors large Hamilton Tote in Montreal in February and was tempted to buy it, however, I had my heart set on the Marc by Marc Jacobs Classic Q Hillier Hobo, so I chose to wait. Being the savvy shopper that I am, I picked up my Michael Kors bag in the States because it retails for $348 compared to $395 in Canada. Now $348 is still pretty pricey, so I chose to pick it up at Macy’s where I got an incredible deal on it – 25 per cent off, plus another 20 per cent for signing up for a Macy’s card – so I only ended up paying US$225. I chose to get the bag in black leather with gold hardware because I find that I often wear more gold than silver. Plus, I like the juxtaposition of the gold with black better than the gold with silver – it looks more expensive. Note, this bag also comes in rosegold hardware, which would have been my first choice, but I heard that it’s only available at the MK boutiques. The bag is very roomy being 14 inches in height by 13 inches wide with a 6-inch diameter. It features top handles, as well as a shoulder strap with the MK signature chain detail. Inside there is a cell phone pouch, a wider pouch, an inside zip pocket with another interior pocket underneath, and a lanyard to clip your keys onto. The lining is beige with the MK logo embossed all over. At the bottom of the bag there are four feet so it protects the bottom of the bag. The leather on mine is nice and supple, however, I have found that after some wear the lock tends to weigh the bag down. For example, if I am just resting the bag on my desk it will flop over a bit. It’s not a big deal to me, however, that seems to be a common problem that has been mentioned in a lot of reviews. As for the exterior of the bag, I find it is similar to the Hermes Birkin bag. The front features a lock and a hanging luggage tag which contains the key. I have seen in a few YouTube videos that you can unlock the lock to make the bag a little wider. 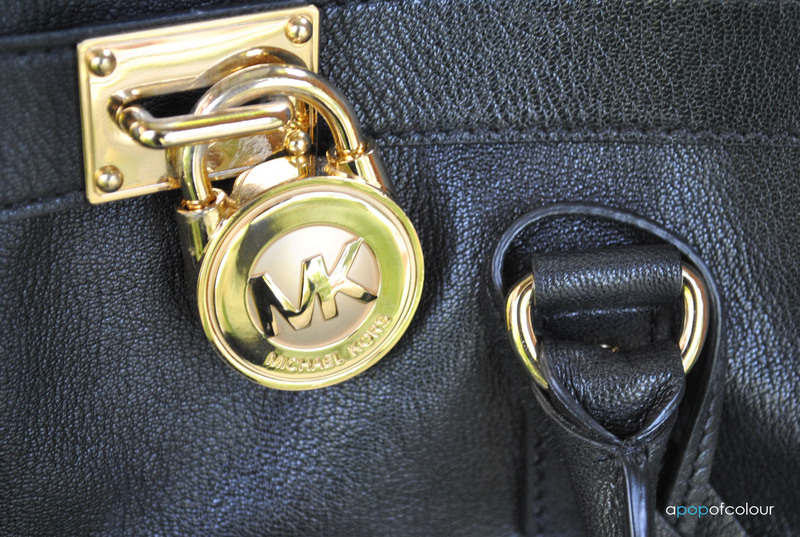 Note, that this tote comes in two versions, the boutique version– which is the one I got, as well as an outlet version, which replaces the lock with a Michael Kors nameplate. I checked out the outlet version at Las Vegas Premium Outlets North but I much prefer the boutique version more. The outlet version is a tad cheaper in price (although I got mine for way less than the outlet price) but to be honest, it’s not as nice, at least in my opinion. To me, this is the perfect work bag. 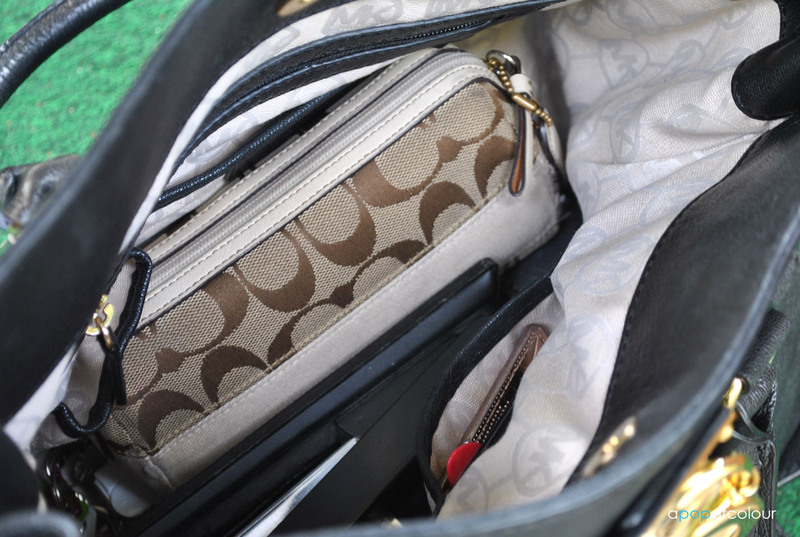 It carries all my essentials plus enough room to throw in my iPad, magazines, magazine proofs, and more. This bag is also perfect for traveling. I highly recommend this tote as it is timeless, well made, and very versatile. Although C$395 is a lot to spend on a handbag, it’s not as much as some others (for example, the MBMJ Hillier Hobo retails for C$448). Plus, it’s a bag that will last you forever if you take care of it and it will never go out of style. Michael Kors offers this style in a variety of different colours, fabrics, and hardware depending on the season, but I myself love the standard black (I did see a gorgeous turquoise in the spring time). MK also offers the Hamilton in a satchel style, however, I prefer the large one, plus if you are going to spend the money, you might as well pay the $50 or so to get a larger bag. But hey, that’s personal preference. If you are interested in picking up this bag, for my American friends, I would check your local department store first (such as Macy’s, Nordstroms, Saks, etc.) to see if they have it on sale or if you can find a discount for it (such as signing up for a credit card). Also, Bloomingdale’s is offering their 20 per cent off friends and family sale going on now. also, if you buy it through an Ebates link, you can get some cash back for it. For my Canadian friends, finding this bag on sale is a little harder. You can always order it online from an American department store but then you will be dinged in taxes and duty. The only two places that I know of that sell this bag are Holt Renfrew and the Michael Kors boutique (and Ogilvy in Montreal – however, I believe it’s a store within a store). Holt Renfrew offers gift card events, where you get a percentage back in gift cards, a few times a year. As for the MK boutiques, I’m sure they offer sales every here and there (although I’m sure it will only be seasonal colours on sale). Or you can just do what I did and pick it up in the States (FYI Macy’s offers an 10 per cent off international discount for those that live outside the U.S.). Do you own a Michael Kors large Hamilton Tote? If so, what are your thoughts? Can the bag develop creases and wrinkles? My daughter recently got me one for Christmas, soft leather, in claret. I love it!